Freemuse defends the right to artistic freedom worldwide. We advocate and take action to free artists, change repressive laws and fight censorship. We use our thorough research and documentation of violations of artistic freedom to influence governments and decision-makers to change laws and practices that limit artistic expression. We take action on behalf of individual artists and audiences whose rights to artistic freedom have been violated. The level of suppression against art in Turkey can only be grasped by going deep into details and history. The sacking of 4,464 public servants including 330 academics sounds alarming, but knowing it also meant the practical closing down of the most important theatre institution of the country is shocking. The arson of a theatre and a cultural centre is scary, but knowing its symbolic significance reminding of the mass murder of intellectuals and artists in 1993 is infuriating. February 2017 has become an effing month for the theatre circles of Turkey. When President Recep Tayyip Erdoğan released the presidential decree – an extraordinary authorisation for the president due to the state of emergency – that sacked 4,464 public servants, academy received a hard blow. 330 of those dismissed were professors. But for theatre, the blow was biggest. The Theatre Department of Ankara University, first of its kind and the theoretical centre of modern Turkish theatre, with seven of its professors dismissed, was left crippled on the verge of closing down. Two weeks later, Müjdat Gezen Cultural Centre, a conservatoire founded by renowned actor Müjdat Gezen, was set to fire in Istanbul. With the dubious victory of Erdoğan in the referendum on 16 April 2017 for much wider presidential authority, results which fiercely contested by dissidents their validity, prospects are even dimmer. On 6 January 2017, a Friday, Süreyya Karacabey was preparing dinner in her kitchen at her house in Ankara, when she received a WhatsApp message from a friend. Karacabey was one of the almost 9,000 public servants expelled with the new presidential decree. It was not a coincidence that the disastrous decree was issued on the Friday night. AKP government had developed the precedent of announcing all explosive legislations and decisions on Friday nights to prevent an uproar in the stock markets the following morning. Although sacking thousands of public servants overnight had almost become habitual since the failed coup attempt and the following state of emergency, nine thousand was a huge figure – and, as was recognised in a few hours, included numerous names who, politically, had nothing to do with the coup or the Islamist sect called Gülen Movement allegedly behind it. Associate professor Dr Süreyya Karacabey is one of the most proliferous intellectuals in the area of theatre theory and criticism. With books on figures such as Heiner Müller and Bertolt Brecht, Karacabey was part of the team of academics in the Theatre Department of the University of Ankara, a historical centre of intellectual production on theatre theory, philosophy, aesthetics and history. The department, founded in 1958 as first of its kind, has been the most important national institution for the intellectual development of theatre in Turkey. Karacabey’s then-comforting thought of welcoming her losing her job to avoid an institutional nightmare turned out to be of no avail. The nightmare she had foreseen to relieve herself became the exact scenario they would face a month later. 7 February 2017, the new presidential decree included six more academics from the Theatre Department of Ankara University. Three professors (amongst them, the head of department), two research assistants and one teaching assistant were expelled. Among the thousands of people who lost their jobs, the academics from the Theatre Department of Ankara University were the ones who got the biggest attention from the public and the local media, as the result was practically the end of being a proper department. The problem was not only lack of the number of professors, their titles also come into effect, because titles means boards, postgraduate and PHD programs, etc. Add the areas of expertise to the equation, and it becomes crystal clear that with seven academics expelled, the department is practically shut down. What shocked Karacabey was the disproportion between the deed and the consequence. Though not officially used as an evidence of culpability in the official bill of indictments introduced by the prosecutors, many believe that the selection of left-leaning academics to get expelled is based on support for the “Petition of Academics for Peace”. The petition, signed by 1,128 academics, was released on 11 January 2016. The Petition of Academics for Peace was a reaction to then-ongoing, systematic use of disproportionate state force in several Kurdish cities. Beginning from early autumn 2015, the illegal armed Kurdish armed organisation PKK started to form urban guerrilla groups and prepare for upcoming clashes with state forces by digging ditches and patrolling on tactically important streets. The violence rapidly escalated as the government’s reaction was harsh. Not only the police, but also the army participated in operations to suppress the Kurdish fighters, introducing round-the-clock curfews for weeks, effectively relocating tens of thousands of city dwellers away from their homes in the city centres and ruining whole neighbourhoods including by using artillery. In January 2016, 1,128 academics released the petition, mainly demanding the state “to renounce curfews, massacres and deliberate exile politics.” The petition also called for national and international delegations to go to the affected cities to investigate and report. The text ended with the call to the government to prepare the conditions of a process of settlement for a permanent solution to the Kurdish national problem. President Recep Tayyip Erdoğan immediately reacted to the petition, naming the signatories ‘traitors’ and blaming them for ‘collaborating with the terrorist organisation’. Dozens of academics from universities all over the country were investigated, detained, and subsequently three of them were arrested, spending three months in jail. The oppression against academy in Turkey resulted in international solidarity with a second petition being released, signed by names like Noam Chomsky, Robert Brenner, Fred Moseley, Tariq Ali, Bertell Ollman and Michael Löwy. Both the United States and Russia expressed their discomfort with the reaction of the government. The investigations diminished in time, until the failed coup attempt on 15 July 2016. Following the coup attempt allegedly organised by the Islamist Gülen movement, an ex-ally of Erdoğan, the government began the process of expelling tens of thousands of public servants from their positions. The last six months passed with sporadic presidential decrees, resulting in thousands losing their jobs. The primary reason was to expel those who had participated in the coup attempt or collaborated with the Gülen movement, but from the start, the coup attempt became an excuse for the government to expel anybody who did not share the government’s political position. When it came to the universities, the list of 1,128 people who had signed the petition became the main source of profiling unwanted professors. However, connecting the oppression against the universities directly to the Kurdish problem or a single petition would not be accurate. Erdoğan’s government has been suppressing all individuals and organisations of the opposition without mercy. Assistant professor Emre Zeytinoğlu, well-known art critic and a signatory to the Petition of Academics for Peace, defined the period as ‘a process of humiliating the academy’, and wrote in an article after the decree in February that it started long before the mentioned petition. Professor Dr Selda Öndül was the chair of the Department of Theatre in Ankara University, until she found out, likewise Karacabey, one evening sitting with tranquillity at home, that she also is one of the expelled academics. Öndül is the embodiment of the tradition of the Theatre Department, not because of her official title as the chairperson, but because her personal history is inextricably connected to that tradition. Her losing her job is nothing to compare with the department being crippled and hundreds of students, who will carry on the tradition of theatre to the next generations, losing more than half their scheduled classes for the semester, and the future of their university career at stake. It is important to understand the pivotal role played by the Theatre Department of Ankara University to make sense of why several professors getting expelled means so much. It was, at the beginning, founded as an institute in Ankara in 1958, thanks to the efforts of Muhsin Ertuğrul, the founding father of modern Turkish theatre. Born in 1892, Ertuğrul was fascinated with the traditional improvised theatre known as ‘orta oyunu’, literally: ‘play in the middle’, as these dramatic performances took place in the middle of public squares. With its written history dating as early as the 12th century and its acting style quite similar to the ancient mime, this traditional form of theatre was fundamental throughout the region’s history as one of the forms of art with which social and political satire and criticism could be expressed liberally. Ertuğrul’s coming-of-age as an artist coincided with the emergence of modern theatre, spearheaded by Armenians, in the soon-to-collapse Ottoman Empire. At the age of 17, Ertuğrul took part in the first Hamlet performance in the country. Before the First World War, he spent two years in Paris and after the war he went to Germany and got interested in cinema. In 1925, he visited the Soviet Union and made acquaintances with Meyerhold, Stanislavsky and Eisenstein. In the 1930s, he went to the USA to examine the theatre and cinema there. All through this period, he was the avant-garde of theatre and cinema in Turkey. He founded theatre groups, movie production companies, wrote articles and shot the first sound movie, a co-production with Turkey and the recent ‘archenemy’ Greece, in 1931. He pioneered the struggle to recognise Muslim women’s right to take on to the stage. Religious authorities of the Ottoman Empire prohibited it for women, and the few who took the risk upon themselves to perform used non-Muslim aliases. This universally open-minded, progressive man of culture focused his efforts to found a theatre institute in the academy in the late 1950s. Eventually becoming a department, the institution’s aim was, as Prof. Dr. Öndül puts it, “executing a programme of theatre art from a scientific perspective, enriching the national theatre scene via graduates and cultivating authors and critics.” Even the building the department used was part of this symbolic political heritage. 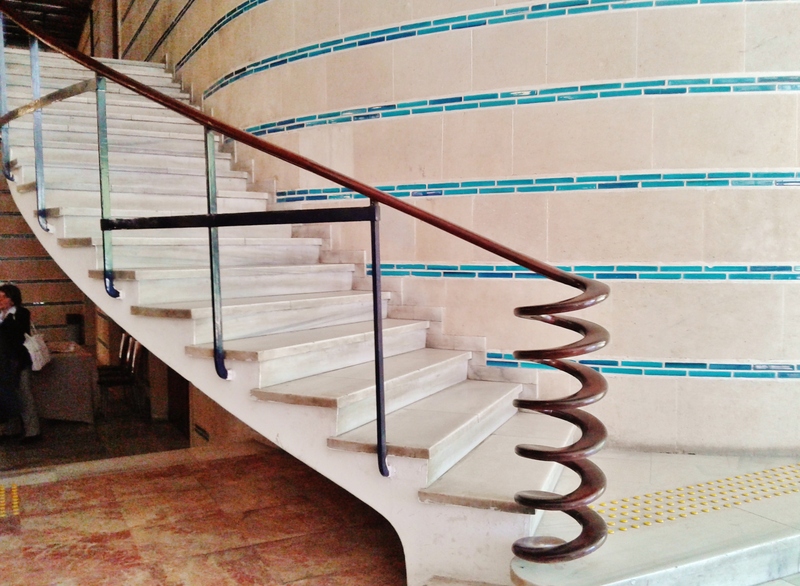 It was originally designed by the prolific avant-garde German Jewish architect Bruno Taut, who having advocating socialist policies escaped the Nazi regime and came to Turkey upon an invitation from the state, which was the case for numerous German Jewish academics in the 1930s. The past lecturers list of the department resembles the hall of fame of Turkish literature and philosophy, including names such as Aziz Nesin, one of the top internationally-recognised Turkish authors of the Republican period. Öndül emphasises the theoretical and historical aspect of the department’s curriculum as the distinguishing factor. The Theatre Department of Ankara University has provided the professors who subsequently founded similar departments in other universities. The graduates created the national literature and archive for theatre. It was working as the human resources department for the Turkish intellectual cultural life. When the academics talk about the ‘historical heritage’ of the Theatre Department, it is not some nostalgic, self-assigned symbolic identity. The department was well-known for its liberal and tolerant environment. Süreyya Karacabey tells an anecdote, which she had no idea would soon become very relevant for her own personal situation. “The ‘middle garden’, as we call the inner open-air patio of the department building, is normally persistently colourful. Always crowded, students dance halay to traditional folk music, you see posters in every wall, lively debates in every corner. Sometimes this attends aggression from right-wing students so you might see clashes, which frequently result in police forces entering the building along with armored vehicles to exploit the situation. Anyway, it was one day this autumn (2016), I walked through the middle garden, and it was nothing like what it used to be. Nothing. Total silence. Soon I learned that more than 40 students were expelled due to political activities. The state of emergency, repressive laws, presidential decrees, legal cases against the dissidents, and a catastrophic foreign policy in Turkey, all these are obvious to the world now. But what deeply damages the social psychology is fundamentally rooted in the transformation of the more obscure parts of daily life. The sinister instances which have widely contributed to a politically polarised country’s half population to not only politically oppose, but emotionally hate the government are hidden in details, in those bits of local news where the government’s general discourse finds a reflection in action in its extreme forms. Dismissal of hundreds of academics is in itself irritating, but the result for the Theatre Department of Ankara University, and thus the theatre in Turkey creates sheer anger. However, still, more vehement occasions lurk much deeper. The early morning of 20 February 2017, people on their way to work noticed something terrible in Kadıköy, the cultural heart of Istanbul’s Asian side. One of the traditional wooden buildings was on fire, the Müjdat Gezen Cultural Centre. People informed the police, fire brigades arrived, and the fire extinguished before the flames devoured the whole building. Once things cooled down, police officers found empty bottles and plastic gloves in the garden of the building. The cultural centre was set on fire. Müjdat Gezen, 74, is a name one encounters in every corner of Turkey’s cultural history. An actor, poet, teacher, author of 28 books, UNICEF Goodwill Ambassador since 2007, and founder of a unique cultural centre, the Müjdat Gezen Cultural Centre. It is the first educational institution to teach traditional ‘orta oyunu’ genre, is a privately owned but tuition-free conservatoire with departments of theatre, music and dramaturgy. The centre offers evening courses for adults and weekend courses for children, and hosts plays and concerts. For Gezen, who has been much productive throughout his life, the cultural centre is the epitome of his work. So, why was the building set to fire? Firstly, there was the ‘apparent’ reason. Gezen had made a joke on tv about a recently-introduced celebrity, the granddaughter of the Sultan Abdülhamit II of the Ottoman Empire and a fierce Erdoğan supporter. Burhan Kuzu, an AKP MP, and the mastermind of the government’s amendments to the constitution, was quick to affront the artist, using phrases like ‘scrap of an artist’, ‘scum’, ‘sludge’ and ‘a burden to the country’. Pro-government media pointed at Gezen as a target, emphasizing that the artist will cast a no vote in the upcoming referendum to grant the president unprecedented authority. Gezen was declared a troublemaker, a traitor. In 2005, then-Prime Minister Erdoğan, who admitted he did not read books at all but “listened to summaries from his aides,” said, “Back in the days I had many friends who read too much, they had libraries. They always got the best grades. Now they are miserable”… in a speech he made for the opening ceremony of a university! It sounds like a very poor recipe for social polarisation: Repeat incessantly this populist, manipulative verbalism of the despair of the poor in order to create abhorrence against the educated. Merge this already-dangerous sentiment with the government’s excessive use of violent measures and libelous discourse against these groups. On the top, add the jurisdiction’s inability (or, much frequently, reluctance) to punish these forms of aggression. You have baked a mentality that warmly welcomes and feels pleasure in every kind of maltreatment against “the elite” amongst a certain part of Erdoğan supporters. After the arson, a pro-government network called Akit, practically the Breitbart of Erdoğan to make a Trump analogy, a radical Islamist news group which nobody took seriously before Erdoğan granted their editor-in-chief the seat next to himself on his personal plane during foreign visits, shared the news on Twitter with the headline ‘Big shock to Pimp Müjdat’. On the Akit TV network, an anchorman has ranted about Müjdat Gezen with an incredible style: “We have been following these men [again the totally abstract reference to ‘the elite’], we know how their mouths smell of piss. These scum present themselves as artists. These are the descendants of a lineage assimilated by foreign infidels. (…) This pimp [Müjdat Gezen] claims to teach art in his cultural centre. ‘Show more legs, show more cleavage’. What do you think the children sent to that school will graduate as? You operate a whorehouse, not a cultural centre Müjdat Gezen!” And the problem was, in fact, this rant was absolutely credible for Turks, as it has been going on with the same sickening tone for years now. The saboteur who set Müjdat Gezen Cultural Centre on fire, a 39-years-old male school bus driver, was caught by the police two days after the arson. In his statement to the police, he said “He reacted to Gezen’s defamation of the granddaughter of the Sultan.” On his Facebook account, hours after he set the building to fire, he was bolder (and grammatically horrid in Turkish): “The God doesn’t have a stick… The degenerated Müjdat Gezen Cultural Centre was furiously burning in the night, if he talks bad about the Ottomans he will kick the bucket, he will perish.” The phrase “the god does not have a stick” means that, as the God does not go on a rage beating its impish sons, he uses other instruments to punish. When the punishment is a result of unforeseeable consequences, you are referring to fate. When punishment is conducted by yourself at your own will, well, you assume the role of police force of the deity. Three days after his arrest, the judge set him free. Due to public reaction, he was again arrested. Later when the criminal charges were pushed, the prosecutor demanded six years of imprisonment, much shorter than expected because, according to the bill of indictment, “the accused committed the crime due to provocation.” Apparently, Gezen’s joke was a plausible cause for a person to arson a cultural centre. Still, to understand the underlying symbolic meaning of this sabotage against a cultural centre, we must go back to one of the most tragic events of the history of Turkey: the Sivas Massacre. On 2 July 1993, dozens of intellectuals were in the city of Sivas for a festival organised by an Alawite foundation. The political situation was complicated: The war between Kurdish guerilla movement PKK and the state was costing lives every day, the left who had suffered a harsh defeat after the military coup of 1980 seemed to be rejuvenating, the state was instrumenting Gladio tactics to suppress the opposition, and the radical Islamist movement called the National View (of which Erdoğan’s party is an offshoot) was on the rise. Days before the festival, the right-wing media was on full provocation mode against the festival and the intellectuals, with Aziz Nesin, (the aforementioned author who had also lectured in the Theatre Department of Ankara University), as the main target. The intellectuals were being called traitors, and Nesin, who recurrently expressed he was an atheist, a profane terrorist. Hundreds gathered in front of the Madımak Hotel the guests were staying at, and torched the building. 33 guests, many the finest artists and intellectuals of the time, and two hotel workers died in the hotel. 51 people, including Aziz Nesin, managed to escape the building in flames. It was an unprecedented massacre not for the number of casualties, but for the identity of the victims and the terrifying atrocity of the mobs. The Madımak Massacre has always been a staple memory for the people in Turkey reminding what the Islamist movements were capable of doing. And it is not perceived as a past event to be forgotten not for symbolic, but tangible reasons. The case against those who took active part in the massacre was dropped in 2012 due to statute of limitations, when AKP voted against a legislative proposal to extend the period of the case. Police brutally attacked the protestors on the day of the last trial, and on several occasions against demonstrations held every year on the anniversary of the massacre. One of the lawyers of those who took part in the massacre eventually became a minister in Erdoğan’s cabinet, another one member of the Supreme Court, three others members of parliament from AKP. The list of lawyers of the mob who obtained important positions under AKP government includes 24 persons. Yiğit Günay is a freelance journalist and art historian based between Istanbul and Havana. Formerly worked for daily soL newspaper as the editor-in-chief. Has published a book on the Arab revolts, and currently working on a new one on Soviet avant-garde art. This article is part of a Freemuse INSIGHT series edited by Marie Korpe. It was published in May 2017. Russian authorities have cancelled a youth theatre play for promoting “hatred against men and non-traditional family relations”.